I landed a 2nd LAR Grizzly. I wrote a piece on my first one and I absolutely love it. A man named Jerry Adams commented on my last LAR Grizzly piece saying he wanted to get rid of one. I emailed him and we made a deal. Jerry is a cool dude, it was a pleasure to talk to and deal with him. If it wasn’t for a couple thousand miles between us, we’d have been good buddies. Anyway, I now have 2 44 magnum LAR Grizzlies. To my surprise there are a lot of differences. Jerry’s was one of the first 100 made, mine was one of the last 100 made…only 1000 ever made so this is a unique opportunity to see the differences from the beginning to the end of a sadly short production life. The Obvious: The early gun I just got has a 6.5 inch barrel, my end of the run gun has a 5.5 inch barrel. As far as looks go I prefer my 5.5 inch gun, I’m betting that extra inch of barrel makes a worthwhile difference when I finally get it to my chrono for some testing. Next, you can’t see it so well here but my later gun has a light gray parkerizing, Jerry’s early gun has a much blacker parkerizing. You’ll see if you look at the top guns mag catch, see the difference? Much lighter parkerizing. I wonder if they switched up from zinc to manganese somewhere in that 1000 gun run? I don’t know. The Markings: On my end gun the markings are much deeper, crisper and of a different print than the early gun below. It’s not just the finish on the old one not being as nice, they are just better markings. 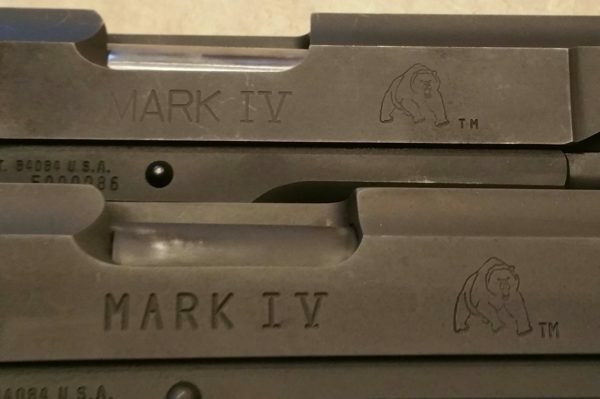 More Markings: On this side you see the same thing, early gun on the top this time and later gun on the bottom. The end run had better, deeper markings. I would think that with a production number of 1000 guns they would have been all done at once and all the same. Clearly they are not…I wonder if it was 1 run of 1000 or if it was broken up in batches. The Sights: I really like the late guns sights over the early gun. 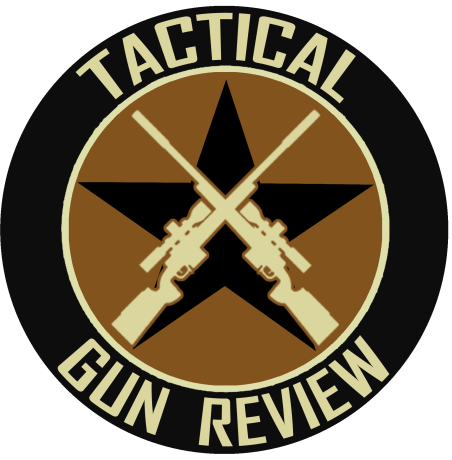 The later guns sights (on left) are 3 dot and smaller, the early gun has a sight like a “T”. It’s ok but I want to replace them with some different ones. I am concerned over finding a set as even the cut in the slide on the early gun is different. More Sights: A profile look at the 2 different sights. Old on top, new on bottom. Even the front sights are different. Early gun on top. 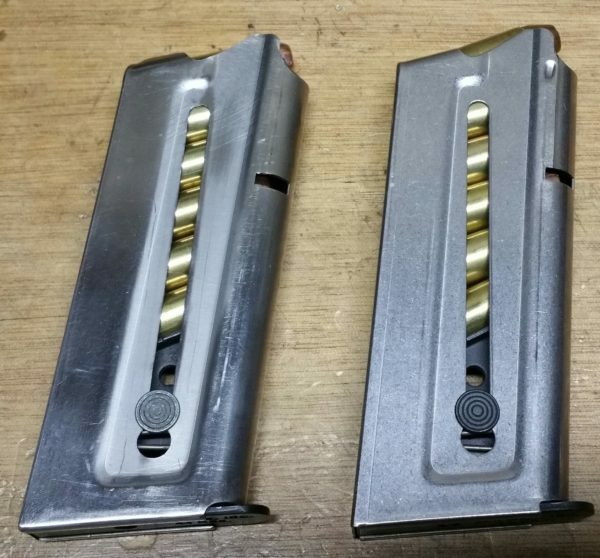 Magazines: The early gun magazine is on the left, note the finish and lines of it are not near as nicely done as a later gun magazine. I wonder if they switched makers? Regardless they all run flawlessly but in person the later mags look much nicer. Notice the smoother lines and nicer finished look of the later magazine on right. It just appears to be made with more attention to detail. Note the difference in the welds. Much smoother on the later mag. Weld is much nicer on the right (later) magazine. Mainspring Housing Pin: Note on the older gun it sticks out past the frame…replaced with wrong one somewhere?? I have no way of knowing but it obviously sticks out past the frame. This is no biggee and something simple to address once I start the customizing of Jerry’s old gun. Both have the rubber backed main spring housing. 1-18-17 Update: The below pictured pin was broke in half I discovered when I took the frame all the way down. That’s why it was sticking out. I got a new pin at local gunsmith shop. Slightly beveled mag well on both guns. Magazine Release: My later gun up front, notice the different mag release buttons. I could care less about the texture but my late run gun has a button that sticks out considerably farther. When I customize Jerry’s old gun I will replace it with a more extended version release. 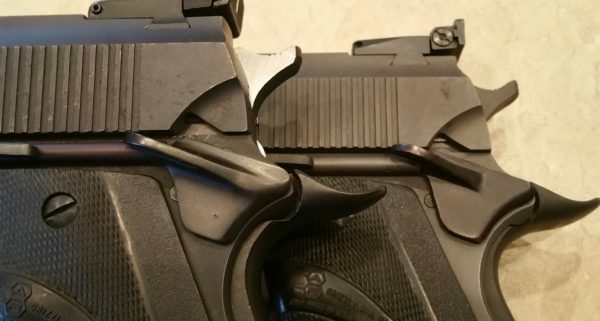 Both guns have the same wrap around Pachmayr grips. I bought a set of micarta grips, they haven’t arrived yet. Extractors: Notice here Jerry’s old gun has an extractor that fits flush, where on my later gun it sticks out. It doesn’t make any difference in function but in this case I like the early gun version more. Safeties and Hammers: The early gun has a silver polished hammer, my later gun a parkerized hammer. They do appear to be exactly the same hammer besides finish. Also notice both safeties are blued. Neither of them are parkerized. I am assuming this was a part they got in from somebody else, maybe late and they just put them in. Who knows, who cares, they are extended safeties and work. You may see a slight color difference in the spring tube. Old gun is unfinished metal and later gun (rear one) is parkerized. Again no big deal, just something I noticed that you never would if you didn’t have 2 side by side. Barrels: Last as you can see the hood is not parkerized on the early gun and is on the later gun. I couldn’t care less either way, just another difference. Early Gun: (#86 of 1000 off the line) Smoother slide action yet a stiffer, slightly gritty trigger. Finish is not nearly as nice but that is not a drawback here. Once I get this done up with a cerakote job I have in mind it will look way better than the later gun. I also don’t care for the sights but again they are coming off the gun as soon as I find a suitable set of adjustable nightsights. Later Gun: (#912 of 1000 off the line) Over all I think it is a much more attractive gun and attention to small details were perfect. I feel like they really had it down pat in the end. I can’t really bring myself to customize such a rare, beautiful weapon. This baby to me is perfect. I love it. I am planning a total custom build on the older Grizzly. Adding a pistol light rail, night sights, trigger job or possible replacement, new mag release and a super duper Kryptec cerakote job. The old girl will be awesome when she’s done. As that project moves along you will have a pic heavy review of the whole transformation. I want to thank my new buddy Jerry Adams for allowing me the pleasure of owning his old Grizzly. You won’t be disappointed Jerry, she came to a good home and I plan to make her beautiful. (more beautiful) LAR Grizzly pistols are great…just one of the coolest thing I have ever owned. If you ever get a chance buy one. They are rare and pricey, they are also worth every penny. Accurate, reliable and built like tanks. They will take anything you can fit in the magazine and ask for more. Simply Awesome!! Thanks for reading and train often. PS. I’m still searching for a 50AE LAR Grizzly. 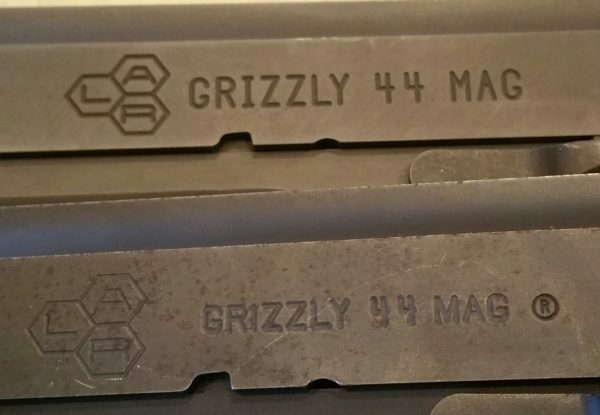 If you have or know of one don’t be afraid to comment here or email me at cary@tacticalgunreview.com It was Jerry’s comment that got this 2nd 44 mag to me. Have not seen this mentioned in the article but on my late sn Mark IV I added a Sprinco Recoil Management Guide Rod System, which they still make for Grizzly’s. That might be useful! I don’t mind the recoil but it would be nice if it keeps the empties from ejecting a mile away. How far is yours throwing them?? And are you running hotter loads or cooler loads? Thanks. Unfortunatly I never used the stock recoil system. I don’t have a lot of rounds through this beast. I have actually been considering selling it. ISO 357/45 mag. Any ideas or directions? Thanks. No, I havent seen any pop up lately. I saw a 44 on Armslist a couple weeks back but he wanted 2K for it. I had a little surprise the last time I was exercising my Grizzly. I shot about 140 rounds when the point of impact suddenly dropped 4 inches and 3 inches left.The second extractor had already lost it’s hook, so the brass was whacking me in the face – But it was suddenly going right where it should (over my right shoulder and about 60 feet away. Whee!). When I go the gun home I did a full strip, and discovered that the barrel bushing had cracked three times at about 12 o’clock. So, going by my own experience, it’s extractors and bushings that the Grizzly eats. After several thousand rounds, the barrel o.d. was worn down by about a thousandth at muzzle. Maybe I need to reduce my powder loads by 2 or 3 grains. I think a Bob Cogan compensator job would be a good idea too. I have been updating the Wikipedia article on the Grizzly recently. It would be nice if you could add a section about the Mark 4. Here in CA, Grizzly’s are very rare, and VERY expensive. Hi Phil, 2nd extractor?? Was it one of the aftermarket supposedly good ones? Or another cast OEM part? Mine are still hanging in there….now that I’ve said that one will break lol. I’m not close to mine right now but if I recall…it was a commander style barrel bushing? I dont think a standard 1911 5 inch will fit. When I get home I’ll pop one out of a 5 inch and one out of my vintage Colt Combat Commander and see which one fits. Would like to do a Wikipedia thing for you! That’s sounds fun, never did that before so how about you email some guidelines in what I should include. Thanks. I knew it Phil! I shouldn’t have said mine were holding up….extractor broke yesterday in the 6.5 inch barreled Grizz. Man, those cases really whack ya in the forehead. Nice to see the thing still works though. I’ll be ordering 2, one for each. The LAR Grizzly MARK V pistol in .50 AE is the pinnacle of the LAR Grizzly hand-cannons (in my opinion) as it has conversion kits that can adapt it for lesser caliber cartridges, with the “holy grail” being the .44 Magnum conversion kit. The barrels from the .44 kit for the Mark V can be reamed in the chamber to accept .50 AE cases necked down to accept the 44-cal (0.429 – 0.430” dia) bullets, also known as the .440 CORBON. The .440 CORBON ballistics are impressive out of a 6.5” barrel, giving .454 Casull like energies. Wildcat cartridge builders also ream the barrels from the .45 ACP conversion kits for the Mark V to chamber .50 AE cases necked down to 45-cal (0.451-0.452”). Thus, the MARK V .50 AE is literally “barrels o’ fun” for the diversity of cartridges, both standard and wildcat, that it can be adapted for. 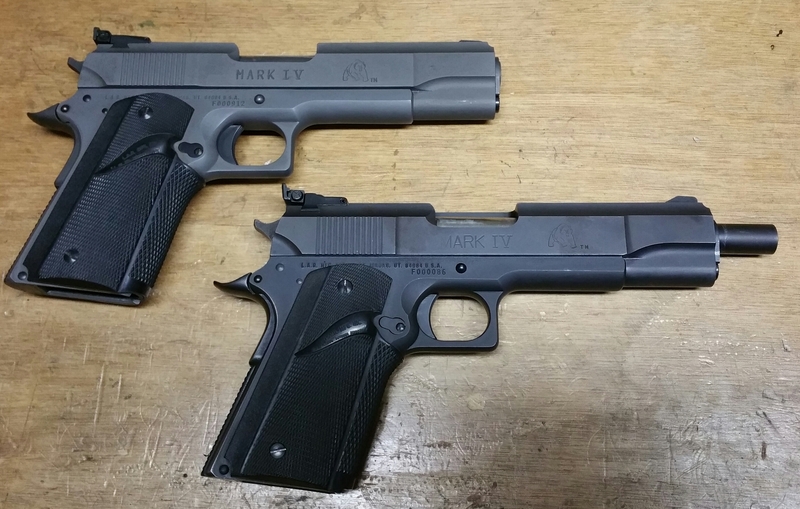 Sadly, the emergence of the .50 AE variant of the MARK V signaled the end of LAR’s production of the Grizzly series of pistols. 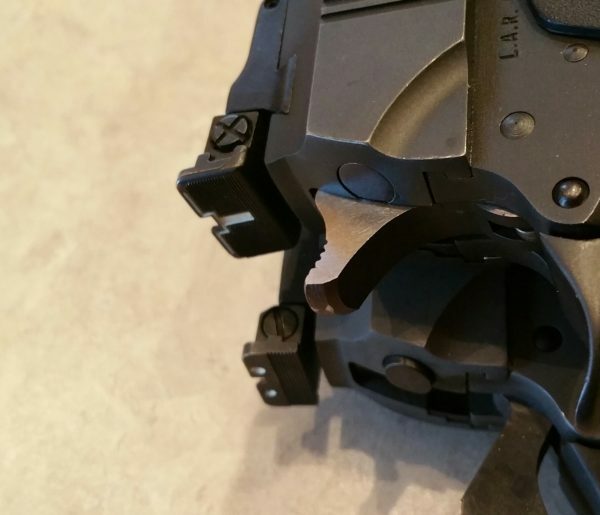 This is because LAR was producing the Grizzly pistols under license to the inventor, Perry Arnett, whose patented design was documented up to the .44 Rem Mag chambering. LAR figured that adapting the design to accept the .50 AE chambering would not only prove to make a popular seller, but that it would also release LAR from any licensing and royalty obligations to Mr. Arnett. When LAR began producing the MARK V in .50 AE, they quit paying license / royalty to Mr. Arnett. Perry filed suit for infringement on his design rights, and brought LAR to the courts for a long legal battle. The courts ultimately ruled in Perry’s favor, and issued the legal order to LAR to cease from manufacturing the Grizzly pistols in any chambering without a licensing agreement with Mr. Arnett. Since LAR was already indebted with legal fees [for their representation] from the court battle, and then obligated to pay the legal fees of the plaintiff, they opted out of manufacturing the Grizzly pistols altogether. Up until around 2006, Perry Arnett was offering complete rights to the Grizzly pistol design for around $500,000. I do not recall any manufacturing entities purchasing the rights or seeking to license the design for manufacture. The LAR MARK V .50 AE pistols come up for sale at gunbroker.com with regularity, with one or two posted at auction there every 3 – 4 months. They are usually in excellent to like-new condition, and fetch hammer prices above $2,500. One of the most interesting and truly unusual and even “rare” variants of the LAR MARK IV pistol is a 44-cal one that was manufactured by [and branded as] Mitchell Arms. If you’re into the outlier variants, that’s a fun one to set your sights on. Carey I have and am going to sell a Mark IV 44 mag and wondered if you had any interested contacts. I thought of the broker but wanted to chat with you first. I have a black 5.5 with orig box and manual with 2 mags,black micarta S&A grips with screws, orig rubber pach’s. Its been stovepipe ported by Cogan at APW. Its in really nice shape and appears fired little. If theres any interest generated here please don’t hes to send anyone my email. Im not a dealer/ffl. Would like to know if LAR Mark IV 44 magnum is still for sale? If not, do you know of anyone selling one. I don’t know…I set the seller up with a buyer and asked them to let me know what happened and neither one bothered too. Sorry. Considering compensator for LAR MK IV Grizzly 44 Magnum. Has extended barrel. Any suggestions? I do not…I know of a guy who has one. I’ll try to get ahold of him and ask. I dont use one myself. I heard you got that baby, he emailed me and said so. Told me about the USPS problem. It’s an Ed Brown 4 Star Comp. There’s a pic of it on my earlier Grizzly article. Just search Grizzly on this site and look at the first one. You’ll see it. I’m always happy to see any mention of the LAR Grizzly. I own two Mar I’s, both in like-new condition, one with a custom accurizing job and chrome plating by the great Bob Cogan. I put 200 rounds through one of my Grizz’s in the last few days, and sheared the hook off the extractor. 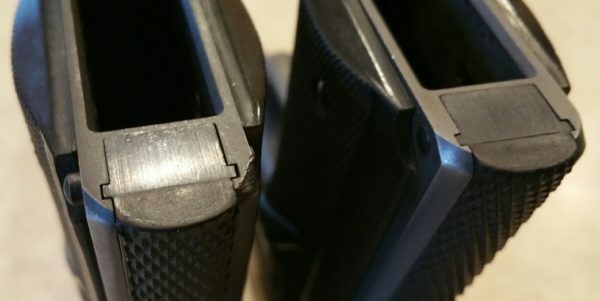 It’s easy to tell when the extractor hook gets gone on a 1911, because every case after the failure ejects straight into your face! Fortunately I bought several EWK extractors, so tomorrow I’l profile one of my spares and be back in business. I’ve asked Erik Kovachick to make firing pins, and he says they are in the queue, but may take a while. His extractors are beautiful. Both of my Grizzlies are Mark I models. My early .45 WinMag doesn’t even have a beavertail grip safety. My .357 is a latter gun. 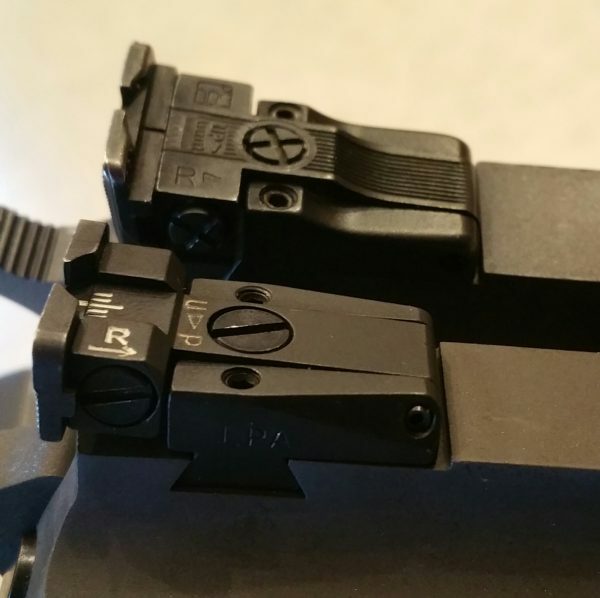 Both have the same rear sights as as you show on your earlier gun. 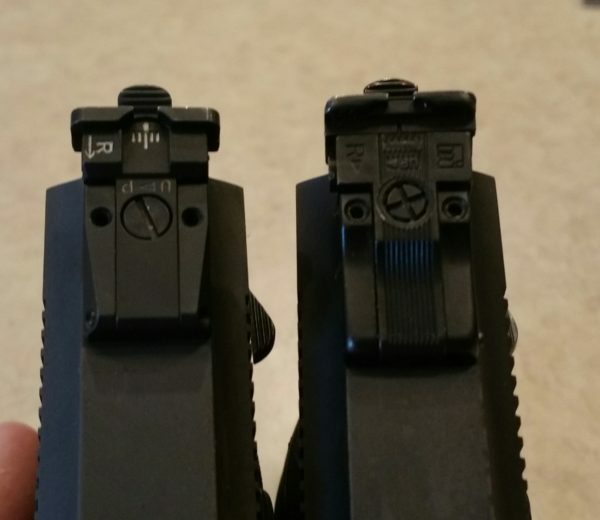 Both have the same front sights as your earlier gun too. I’ve heard that they were supplied by Millett. I’m wondering if your late gun has had some work done. Since the barrel hood is Parkerized, the sights are different, and the magazine release is not serrated. Both of my guns have finished hammers. You are correct in the engraving. My early gun has engraving that is not as pronounced as my later gun. Both of my guns have a flush mainspring housing. The earlier has the extractor more flush than the protruding one you show, but the rear of the extractor is more rounded than the later .357. 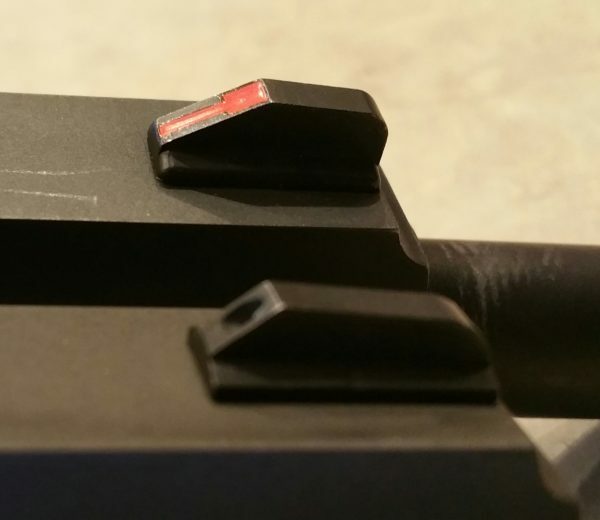 Both of my guns have your late serrated style magazine release button. Both have the 6.5 in barrel option. You have a couple of fine examples and I’m anxious to see your earlier Grizzly mods! Keep us up-to-date on its progress! Tim, I think some work done on the later 912 gun is possible. When stripped and I compared feed ramps in the frames, my later gun had a much nicer polishing job on it. As if it had been refinished and then repolished by a pro…it sure is possible that’s what happened. Thanks for pointing out some of your differences, I need to set up some kind of picture thing for guys like yourself to send pics and tell me what it is so I can accurately caption it. 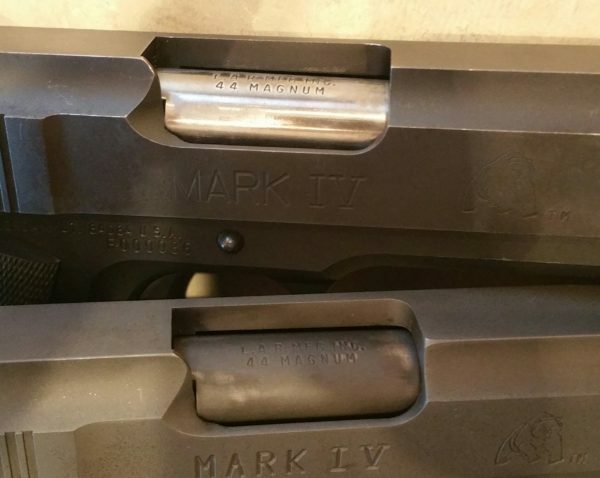 Will the later mags for the mark 1? It is a mark 1 45 win mag. All I can find are mark v mags online. Thanks. Finding info on them is non-existent.